Whether you purchase a General Pass or pay daily admission, you can enjoy a wide array of drop-in programs. 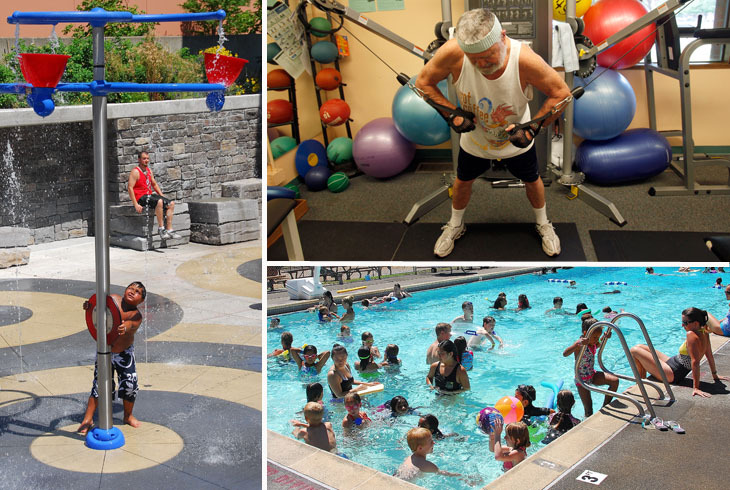 THPRD's drop-in programs allow visitors to enjoy fitness on their own schedule. Most of these programs are offered daily, year-round. Unlimited participation in each activity listed below is included with the purchase of a General Pass. Daily rates are available for less frequent users. See rates. Please note that all drop-in activities are subject to change without notice. Please call the facility directly to verify drop-in activities and times. Our four recreation centers each offer drop-in use of fitness equipment, including treadmills, elliptical machines, free weights, circuit training and more. Designed for those who can swim lengths of the pool on a non-stop basis. Participants are required to follow circle swim pattern. All ages and adult sessions will be designated. Unstructured swimming for guests of all ages. An adult or guardian must accompany any child under 43 inches from the chin down and under the age of 7. Wanna get some shots up? This unstructured activity is offered for basketball players of all ages at Cedar Hills, Conestoga, Garden Home and the Athletic Center. A variety of sports are available for drop-in play, including basketball, volleyball, futsal, table tennis, pickleball, and badminton at Cedar Hills, Conestoga, Garden Home and the Athletic Center. Walkers/light runners who want to escape the elements and run on a soft surface can do so at the Tualatin Hills Athletic Center. About 6.5 laps = one mile. The district's first splash pad, at Conestoga, is open seasonally as weather permits. Visit our event page for several special events -- including Women Only Swim, Wipeout!, Dive-In Movies and more -- many are are available at the drop-in rate.